Millimeter waves were all over the news in the past year. U.S. major carriers: AT&T and Verizon, backed by major system and chip vendors, are definitely leading the trend and the technology proof of concept. Verizon and AT&T conducted several trials that focused mainly on testing the performance of the millimeter wave (mmWave) technology for the Fixed Wireless Access applications. In parallel, Verizon invested billions of dollars to secure assets in the licensed mmWave bands, aggressively acquiring service providers and holding companies that had previously obtained licenses in 28GHz and 39GHz bands. During the final days of December 2017, 3GPP completed the 5G NR spec. It enables vendors and component manufacturers to go ahead and develop chipsets, so trials can start in 2019. The recently defined standard refers to a backward compatible architecture, leverages both the LTE and the NR air interfaces and the existing LTE core network and can probably apply to the big carriers. The specifications of a standalone architecture are expected to be completed in June 2018. In the past years, we noticed that commercial deployments using new standards took 3 to 4 years to be launched. Back in summer of 2016, when the FCC opened up additional bands for 5G in the U.S., the band that gained most of the spectrum was the 60GHz (or the V-band). This year we’ve seen Siklu, and other vendors, reveal Point to Multi-Point products, achieving multi-gigabit speeds. 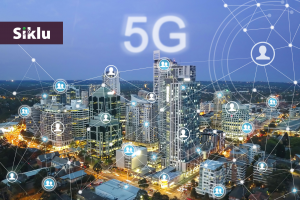 According to the Maravedis white paper mmWave technology over the 60GHz band can enable broadband delivery for small MDUs and even single family homes for as a low as $300/apartment. This technology is particularly important for smaller service providers that are now able to deliver fiber-like fixed broadband services using lightly licensed and unlicensed mmWave bands without paying an arm and a leg for the spectrum licenses. 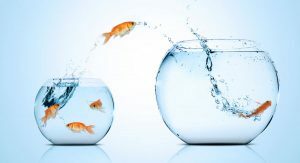 Using these bands, service providers can stop customer churn, provide 5G superior service and customer experience, and grow the business. mmWave technology is used today in hundreds of cities in the U.S. and worldwide to enable Safe City and Smart city applications: Connect cameras, WiFi APs, Small cells and various other sensors. E-band (70/80 GHz) is the other band that can help address the growing data demands. The equipment that operates in this band is used for middle mile connectivity and is capable of delivering up to 10Gbps of symmetrical capacity. No matter what access technology is used, and even no matter what the application is: Fixed or Mobile, the aggregated capacity performance of E-band mmWave technology grows even faster than the capacity achieved at the network edge. In 2017, the number of E-band radios registered in the U.S. grew by 117% compared to 2016! The lightly licensed nature of this band means that the service provider paid a negligible license fee, yet still benefits from licensed radio link. 6. 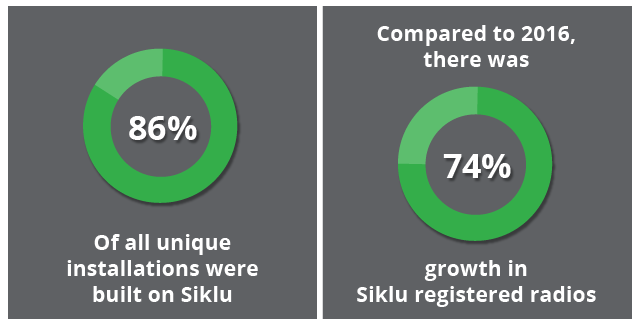 How did Siklu do in 2017? We worked very hard to continue to stay ahead of the curve. To make it easier to adopt the mmWave technology, we’ve provided a free link budget tool to calculate the performance and connection availability, we also introduced a business case tool to illustrate the positive numbers behind MDU connectivity projects and offered an equipment leasing program to help service providers with attractive equipment financing options. We don’t have a crystal ball to see how 2018 will turn out, but one thing is clear: the demand for bandwidth will continue to grow, Video will dominate both mobile and fixed use cases, and our homes and the cities will become smarter and more connected. When you add the mmWave (millimeter wave) tools to your toolkit, you can deliver more gigabit connections and delight your customers in 2018.